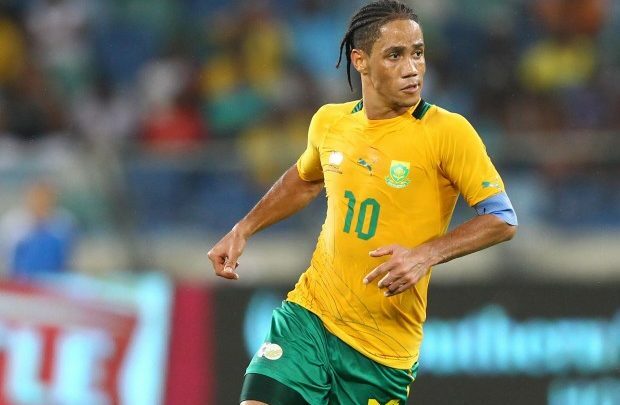 He was an electrifying presence as the ace playmaker for Bafana Bafana and many other teams, but now Steven Pienaar has called time on his football career. The former national captain, who will turn 36 next month, made the announcement on Wednesday night during the SABC TV show Sport@10. Pienaar earned 61 caps for Bafana Bafana, and played at the 2002 and 2010 Fifa World Cups. He also featured for a number of clubs around Europe, including Everton, Tottenham Hotspur, Ajax Amsterdam and Borussia Dortmund. “Today I’m announcing my retirement from football. I just want to say thanks to my mom, my family, and all the clubs that I’ve played for. And to the supporters of course – how can I forget you!” Pienaar said in a short video on his Twitter account. He first rose to prominence at Ajax Cape Town as a teenager, having caught the eye at the School of Excellence. Hailing from Westbury in Johannesburg, Pienaar – nicknamed “Schillo” after Italian star Salvatore Schillaci – graduated from the Urban Warriors to the mother club in Amsterdam in 2001, beginning a 16-year journey through Europe, before he returned to South Africa to play for then-PSL champions Wits.